The Healthy Hoff: The Food Show! Today, I hit the Fabulous Food Show at the I-X Center in Cleveland, Ohio for the first time as a vegan. I didn't have very high hopes, but to my surprise there was a little bit of something for everyone, even a whole foods, plant-based girl like me! I was also very happy to see so many locally-owned business doing their thing! I was relieved to find a Subway there, so if no one could accommodate me, at least I could get a veggie sandwich. Honestly, when I go to these types of events I'm always concerned with starving. But, at the way back of the event, the food trucks gave me hope! 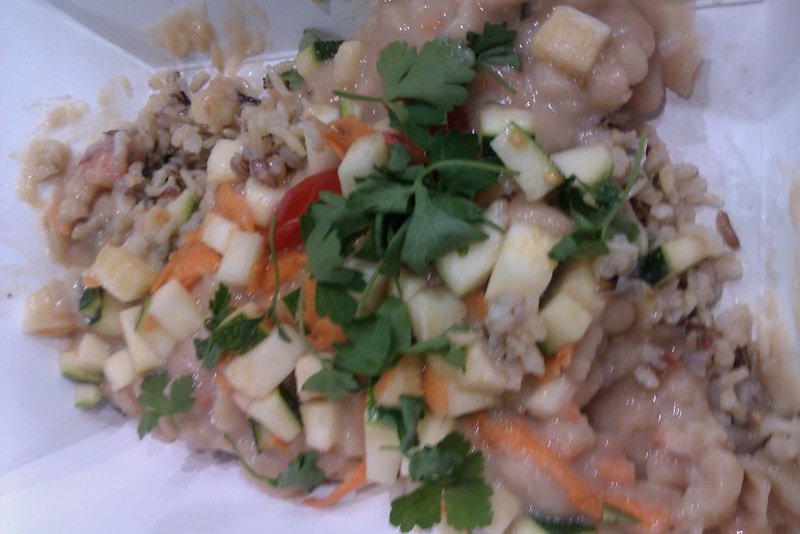 I scored a very tasty entree of baked white bean mash with carrots and fresh zucchini in a lemon sauce - oil-free & vegan, double score! This vegan meal came courtesy of StrEat Mobile Bistro, one of Northeast Ohio’s newest gourmet food trucks, making the rounds in the Cleveland area! When traditional restaurants drop the ball, food trucks always pull through, never be afraid to approach them, they just might surprise you to how with it they are when it comes to vegan/vegetarian connoisseurs. After lunch, it was time for dessert! I hit the various bakery booths, and scored with two that offered vegan options! The first, Ciste by Crystal, located in Parma, Ohio. They had the most adorable tiny cupcakes and I am a sucker for a cupcake. They only had one vegan option on hand, a French Toast Cupcake, but that's all I needed and it was delicious! I was told that they can make anything on their menu vegan - I like the sound of that! The next bakery was About the Cake. They didn't have any vegan goodies on hand today, but they do offer them as well as gluten-free - both of which can be ordered via their website & they deliver! About the Cake also does those tricked out designer cakes you see on Food Network! One vendor there had dark vegan chocolate which was awesome, some painted like Aztec gold - but I ate my sample piece with such delight, that I forgot to get their card or even their name (sorry nice man who deserves a shout out). I did get a Chocolate Chia Cinnamon Bar from Fantasy Candies, another Cleveland-based company! They won't come out and say they are vegan, but close inspection of the ingredients revealed that this bar at least was! Aside from the eating, there was the shopping. Lots of cool little gadgets and niche vendors. I think Beanilla was my favorite because their booth smelled the best! They sold various flavors of vanilla in all forms. I got myself some whole Madagascar Vanilla Bean so I could make my own vanilla sugar - super excited for that! Then the Tupperware lady (her real name is Loretta DiCenso-Tiber) got a hold of me and I had to pick-up a the Time Saver Chop N Prep Chef - it's a small chopper that I can use to quickly grind up small quantities of nuts, garlic, ginger, herbs, almost anything. 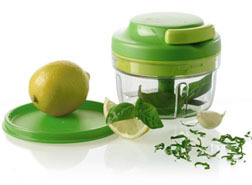 I already used it and it did an awesome job on some fresh cilantro. Something I didn't buy, but think is a totally cool new concept is a grow your own mushroom garden kit by Back To The Roots! 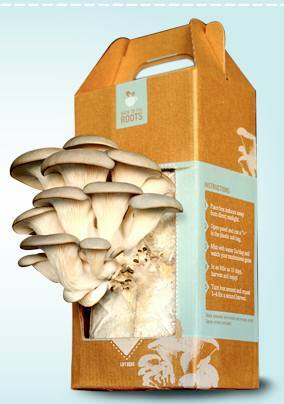 Everything you need to be your very own mushroom farmer is in one little box. In fact, your mushrooms grow in the box or rather out of the box! In 10 days and with very little effort, you can have 1 1/2 pounds of oyster mushrooms in your kitchen or wherever you like to grow things. The very helpful girl at the booth told me that oyster mushrooms are similar to Shitaki mushrooms and that you can get up to 4 crop yields out of one box, not bad for $19.95! 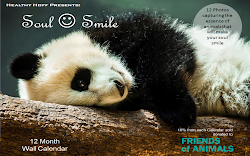 I had a very nice chat with Amy Jamieson-Petonic, a Cleveland-based health & wellness coach. She runs Nutrition Today with Amy J and offers a variety services for all your health needs. Super nice, full of energy and good info! Lastly, I stumbled upon a pick-your-own berry farm - I do love farms! This one has been right under my nose for years, who knew there was a farm in Brooklyn, Ohio! Rosby Greenhouse & Berry Farm located at 42 E. Schaff Rd, Brooklyn Hts., OH 44131 is open to the public for red raspberry picking mid-August thru October - already marked my calendar! All in all, a good show! 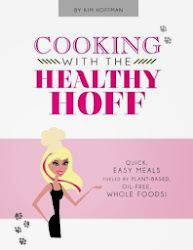 Event: Healthy Hoff to Speak on Sprouts! Baking Soda To The Rescue!